Hi! 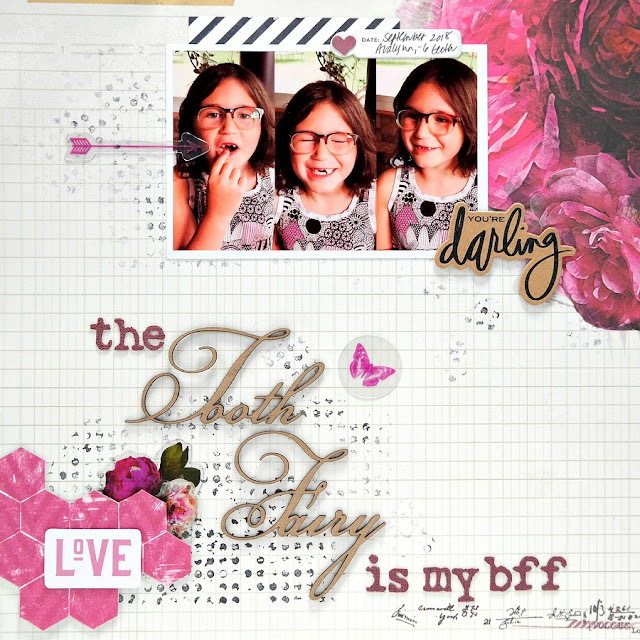 I'm sharing a scrapbook layout that I created for Creative Embellishments today. My darling niece is absolutely thrilled to be losing teeth 3 times faster than her older brother. She has been visited by the tooth fairy several times recently. I designed this super cute layout in under 30 minutes. 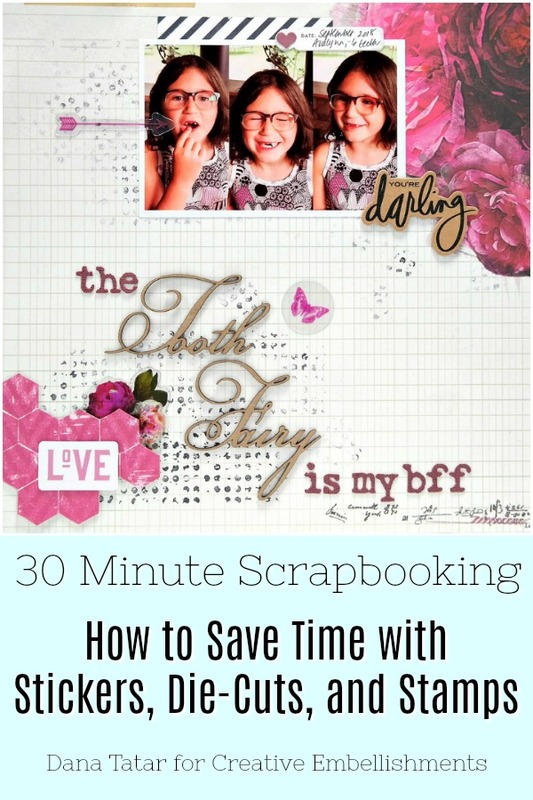 I was able to save a lot of time by using stamps, paper and chipboard die-cuts, and stickers. I applied some elements to the page using Thin 3D Foam Squares to add dimension. Background stamping makes a great base for patterned paper and photos. 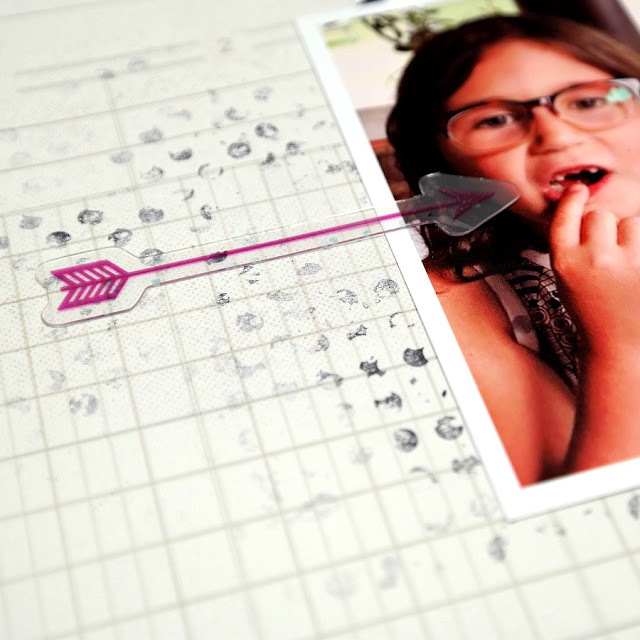 I used the Distressed Circle Stamp with black archival ink to add circles to the page in a visual triangle starting from the bottom left corner, up to the right side, and over to the top left corner. I only applied ink to the stamp once, which saves time, but also produces a cool color fade effect. I added small pieces of patterned paper and a mix of paper and acetate die-cuts to the page. The variety of embellishments I used adds interest to the design, but most of the pieces were pre-cut, so I didn't spend too much time on this step. Some of the die-cuts I used were Kraft, so I thought a raw chipboard title would coordinate nicely. 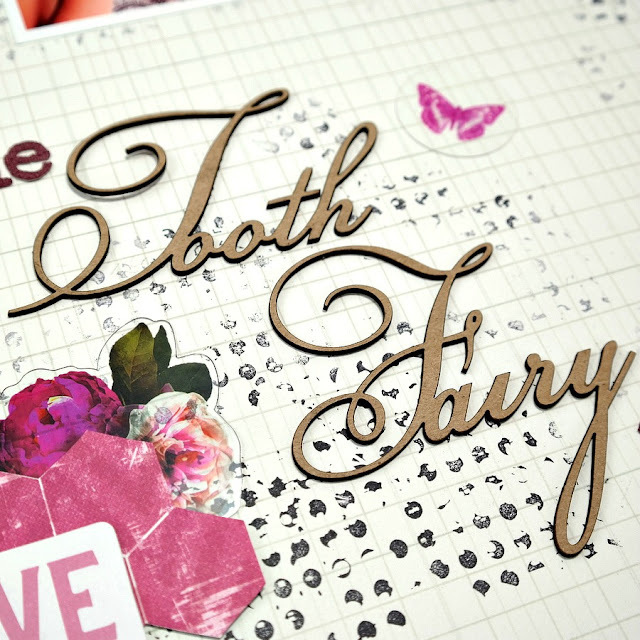 I used the Tooth Fairy Chipboard Words from the Tooth Fairy / 1st Tooth Set and stickers to complete my title. If you're looking to celebrate special events and milestones, be sure to check out the Titles, Quotes, and Sayings section of the Creative Embellishments Store for the perfect chipboard title. Love love love love this! LOVING those adorable photos, the colors and the title! !